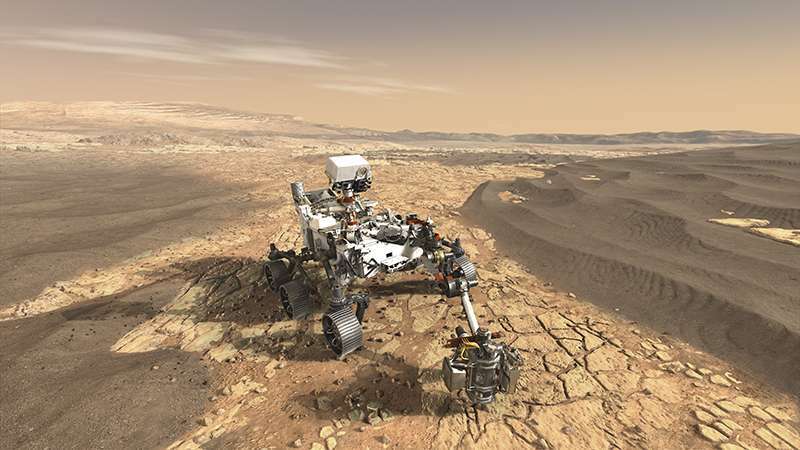 A rendering of the Mars 20/20 Rover, courtesy of NASA. The search for biology on neighbor planet Mars won't play out like a Hollywood movie starring little green men. Rather, many scientists agree if there was life on the Red Planet, it probably will present itself as fossilized bacteria. To find it, astrobiologists likely will need to decode the chemical analysis of rock samples performed by a rover (like the one NASA plans to send to Mars in 2020). Only then might humankind know conclusively that life exists beyond Earth. "You've got your work cut out if you're looking at ancient sedimentary rock for microfossils here on Earth—and even more so on Mars," said Craig Marshall, the paper's lead author and an associate professor of geology at the University of Kansas. "On Earth, the rocks have been here for 3.5 billion years, and tectonic collisions and realignments have put a lot of stress and pressure on rocks. Also, these rocks can get buried, and temperature increases with depth." "You can see a steak looks biological—there's blood dripping from it," he said. "Then, you put it in a pressure cooker for very long time, and you end up with charcoal. It could be abiotic charcoal, or it could be made from heat and pressure on organic materials. A lot of biological compounds get destroyed and ripped apart from heat and pressure, and you're left with carbon residue. We can see this carbon with Raman spectroscopy." "People say, 'If it looks like life and has a Raman signal of carbon, then we have life,'" Marshall said. "But, of course, we know there can be carbonaceous materials made in other processes—like in hydrothermal vents—consistent with looking like microfossils that also have some carbon signal. 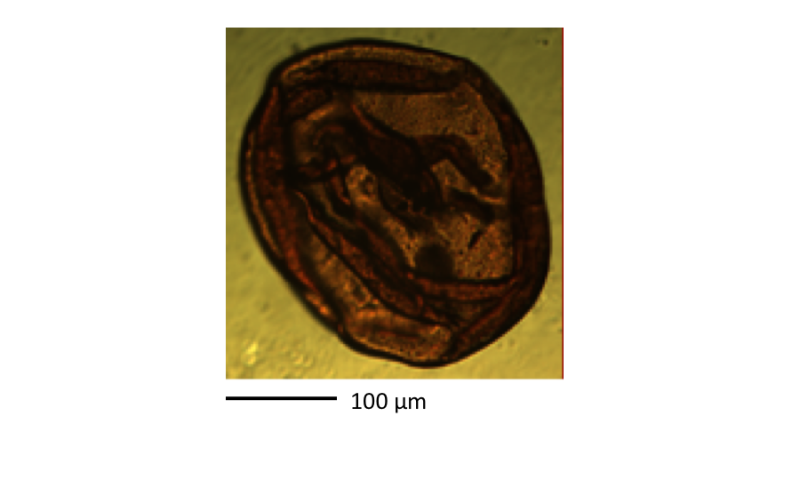 People also make wonderful carbon structures artificially that look like microfossils—exactly the same. So, we're at a juncture now where it's really hard to tell if there's life only based on morphology and Raman spectroscopy." "We applied a new technique called X-ray fluorescence microscopy—it looks at elemental composition," said Marshall. "Vanadium is an element in the periodic table, a transition metal. It's been shown it can substitute into biological compounds. If you can't unambiguously assign if something is biology or not with morphology and Raman spectroscopy in tandem—maybe we could look for a known biological element, like vanadium. Then, if the material that looked like a microfossil, and looked carbonaceous with Raman spectroscopy—and had vanadium—that's a new way forward for finding out if something really was biology." "Vanadium gets complexed in the chlorophyll molecule," Marshall said. "Chlorophylls typically have magnesium at the center—under burial, vanadium replaces the magnesium. The chlorophyll molecule gets entangled within the carbonaceous material, thus preserving the vanadium. It's like if you have a rope stored in your garage and before you put it away you wrap it so you can unravel it the next time you need it. But over time on the garage floor it becomes tangled, things get caught in it. Even when you shake that rope hard, things don't come out. It's a tangled mess. Similarly, if you look at carbonaceous material there's a tangled mess of sheets of carbon and you've got the vanadium mixed in." Marshall and his colleagues proved the concept of testing for vanadium on known microfossils with acknowledged biological origins on Earth—organic microfossils called acritarchs that might not be far from the kinds of traces of life possibly existing on the Red Planet. "We tested acritarchs to do a proof-of-concept on a microfossil where there's no shadow of a doubt that we're looking at preserved ancient biology," Marshall said. "The age of this microfossil we think is Devonian. These guys are aquatic microorganisms—they're thought to be microalgae, a eukaryotic cell, more advanced than bacterial. 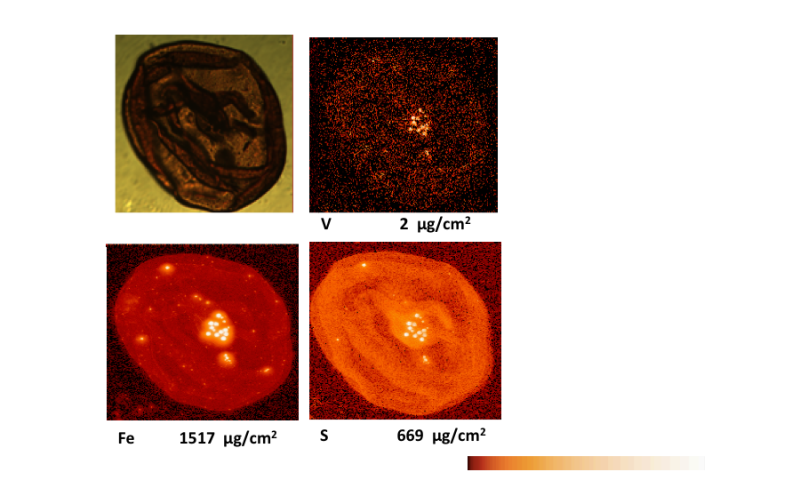 We found the vanadium content you'd expect in cyanobacterial material." Sh, if I understand this article correctly? The researchers are claiming that known biologicals utilize the element magnesium as part of the chlorophyll structure. During the processing (on earth) of biological materials into fossils, the vanadium replaces the magnesium. So Sh, your caveat is a legitimate concern. If Early Mars had life as we would recognize it? Did they develop a similar link between magnesium and chlorophyll as Earth life? Did Mars biology follow a similar path to fossilization as that of Earth lifeforms? Unless more definitive evidence can be found, we should be conservative in our assumptions. And not confuse speculation with proven facts. I does seem like a stretch to assume Martians would have evolved chlorophyll. If vanadium isn't found, I don't think means much, but it it is found, along with other signs of past life, it might be good supporting evidence of past plant life. I would guess that is along the lines of what the scientists are thinking, but the message got garbled in translation to Laymanese. With the caveat, Mars life forms may not have ever had Vanadium in it, then back to the drawing board. And that's ok, it's business as usual. Science is constantly testing and confirming/refuting hypothesis. Tt, the point that the researchers were trying to make in this article. Warning us to be cautious in our assumptions that we achieved definitive knowledge. They point out that there are a number of natural and artificial processes that produce false fossils. Materials that are not of biological origin but produce items that mimic biological fossils. Sorting out the real from the imitation is what this research program is attempting. None of us should assume of the grandeur of our wisdom when we proclaim discovery of the next 'Cardiff Giant'!